The Ferret powered by Easy Tiger Racing lived up to their reputation today by going hard despite a late night of partying, fun and games. 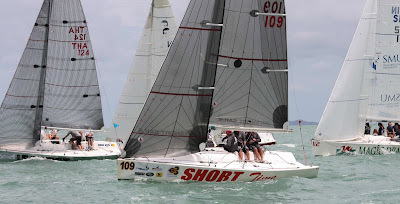 The Australian team with the enforced curfew of not calling it a night before 2:00am by their Skipper stepped up to the plate today by giving the fleet a run for their money despite their own slight fogginess. Three windward/leeward races were held today in light 8 knot conditions for the Platu 25 class fighting it out for the Coronation Cup and Team Tiger finished the day with a fifth, a first and a second. This positions the Australian team in first place with a handy four point advantage over their closest rival Rolf Heemskerk’s Nataya. “We might have been dusty (closed bars at 3:00am) but we dusted off the fleet today. It was a great day with a very happy ending. I'm stoked. 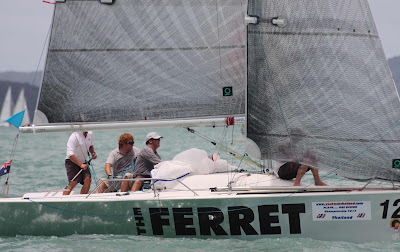 It’s the halfway mark of the regatta with five races down and five to go,” Skipper Chris Way said back at the dock. “Consistency, consistency, consistency is what our coaches have always drummed into us and even though there is one race we can drop, it's best to assume nothing." Nataya, skippered by Rolf Heemskerk slipped up with a sixth and fifth in the first two races, but found her way with a first in the last race today to remain in touching distance of the leaders and lies second overall. 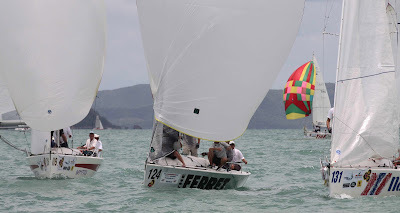 Naiad, skippered by Chai Weiguo, continued their move up the leader board into third overall after a second, fourth and fifth placing today. Some skippers headed for the wrong windward mark laid for the bigger boats and only realised their mistake when the boats behind peeled off and left them looking mortifed.